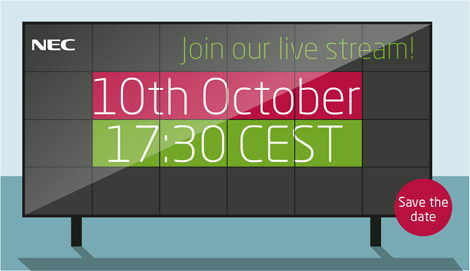 DailyDOOH » Blog Archive » What Exactly Are @NEC_Display_EU Up To? What Exactly Are @NEC_Display_EU Up To? NEC Display Solutions is obviously up to something – possibly big, as they’ve been teasing their European partner network this past week with a number of emails that we’ve been privy to. … and news of a live stream on Monday October 10 at 16.30pm BST, which they claim will be an “industry-changing event which will revolutionise Digital Signage”. With one half of the Europa Twins (the other half unexpectedly quit last week) lined up to keynote the NEC Display Trends Forum taking place in Rome and Thomas Walter, Section Manager, Strategic Product Marketing at NEC Display Solutions Europe seemingly managing twelve stream one would assume that any announcement is hardware related. NEC Display Solutions of course are the one display manufacturer who has remained digital signage software agnostic and at this time has no SoC capability – instead relying on OPS. Could this be a SoC announcement? This entry was posted on Friday, October 7th, 2016 at 16:08 @714 and is filed under Scuttlebut. You can follow any responses to this entry through the RSS 2.0 feed. You can leave a response, or trackback from your own site.